In the Seventh Century the Roman Pantheon was dedicated to St. Mary and the heroic sons of the Roman Church, who had suffered martyrdom. The martyrs indeed seem to have a particular right to the glory of the Resurrection on account of their perfect resemblance to Christ crucified; and many ancient liturgies kept a special feast in their honor in the very midst of the Easter festival. Today’s station ad Martyres remains as a last record of this early liturgical tradition, for, later on, the collective feast of the martyrs was transferred, even in Rome, to the middle of the month of May, and still later to the first day of November. The Introit contains an allusion to the paschal feast of the neophytes, who, like the Israelites of old, have escaped from the slavery of Egypt across the Red Sea, which is a symbol of holy Baptism. The enemy who was overwhelmed by the waves is Satan, or sin. The covenants in the Old Testament are the figure of the new covenant under which the neophytes were brought through the baptismal font unto the adoption of children of God The doctrine taught in the lesson taken from 1 Peter is that contained in the article of the creed: “He descended into hell.” Among the souls in Limbo were patriarchs and prophets and some who had paid no heed to the warnings of Noe when and he predicted the destruction of the world in the flood.The words must not be taken to mean that Christ preached in hell in order to convert the souls who had already been condemned for their sin of unbelief; for the state of the soul cannot change after death. Christ descended into the abode of the dead to announce both to the good and to the wicked the redemption now accomplished; to the good for their supreme consolation, to the wicked as a further reason for their condemnation. Dearly beloved, Christ died once for our sins, the just for the unjust, that He might offer us to God, being put to death indeed in the flesh, but enlivened in the Spirit. In which also coming, He preached to those spirits that were in prison, which had been some time incredulous, when they waited for the patience of God in the days of Noe, when the ark was building; wherein a few, that is, eight souls, were saved by water. Whereunto baptism being of the like form, now saveth you also; not the putting away of the filth of the flesh, but the examination of a good conscience toward God, by the resurrection of Jesus Christ, our Lord, Who is on the right hand of God. This is the day which the Lord bath made: let us be glad and rejoice therein. V. Blessed is He that cometh in the name of the Lord; the Lord Is God, and He hath shone forth unto us. Alleluia, alleluia. V. (Ps. 95: 10) Say ye among the gentiles, the Lord hath reigned from a tree. This day shall be for a memorial to you, alleluia: and you shall keep it a solemn feast to the Lord: in your generations, an everlasting legal day, alleluia, alleluia. 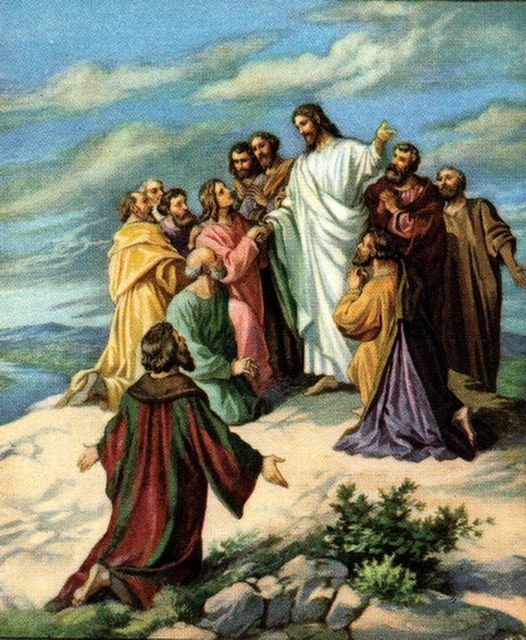 All power is given to Me in Heaven and on earth, alleluia: going, teach all nations, baptizing them in the name of the Father, and of the Son, and of the Holy Ghost: alleluia, alleluia.